Johnny English. Working Title Films 2003. I’ve been looking for this for years. It’s easy to find the sequel, it’s much harder to come across this one. I’m not sure why that is. The marketing looks like it’s positioning this as “Mr. Bean is James Bond”, but I’m hoping Atkinson will be doing something closer to Blackadder. Some of that hope may be fueled by the idea that if it’s the case, it might find a place as a missing link in my silly theory that Atkinson’s Doctor in The Curse of Fatal Death is a continuation of the Blackadder line, which tends through history to get smarter (though usually of lower station). my personal challenge to watch at least 20 documentaries in February was a success. I still have an ongoing Patreon experiment. 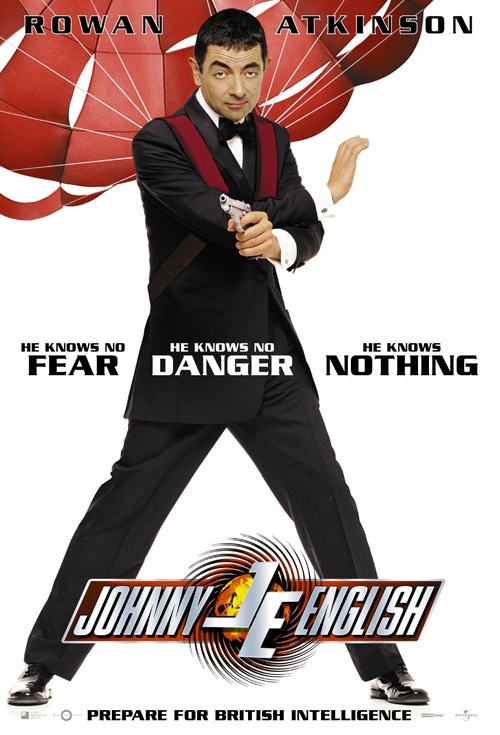 Johnny English dreams of being MI-7’s top elite agent, but his abilities relegate him to desk work and guard duty. When Agent One dies in the line of duty, all of MI-7’s other agents attend the funeral, except for English and his assistant Bough, who are in charge of securing the perimeter. Then a bomb goes off at the gravesite, and suddenly English is the only agent MI-7 has left. Following the trail Agent One was on leads English to having the Crown Jewels stolen out from under his nose, but then on to French businessman Pascal Sauvage. What could Sauvage possibly want with the Crown Jewels, as well as a perfect mask likeness of the Archbishop of Canterbury, the only man who can crown a sovereign of England? English is a very physical role with an over-inflated sense of self-confidence. Somewhat closer to Bean than Blackadder, but nowhere near the near-total pantomime of Mr. Bean. I would have preferred a wittier character, but English isn’t smart enough to be witty. Before his promotion, he wears a grey suit and tie that I’m sure must be, if not exactly what Mr. Bean wears, then a better-tailored version of it. I can’t imagine that wasn’t intentional. English pretty much only ever gets ahead, not through his own ability, but through a pretty typical “idiot protagonist” trait of having competent people who are basically sworn to help him. This is Bough, his assistant, and eventually an Interpol agent. Both of them apparently just like him enough that they’ll follow his lead, at least until they fill in a gap with their own (better) ideas. In Bough’s case it might be more out of a sense of duty. As an American, I am aware of the English-French rivalry, but I don’t respond to it in the way the English do. I know it’s somewhat analogous to state/state rivalries, sometimes with a hint of resentful respect (we get our respect of French finery and classy French words from the English) similar to some facets of our relationship with England, but making those comparisons doesn’t change the fact that I’m a few steps removed from really grokking the jokes at the French’s expense. Not every part of every work is for Americans, nor should it be, but sometimes these jokes were just clunkers for me. Sauvage’s plan is riddled with red herrings, which don’t make sense because at every step of the way, he never expected English to be a problem that needed to be bluffed out. Most directly, while he steals the Crown Jewels, I don’t see what he gains out of that since he had to have them anonymously returned in order for the later stages of his plan to work, and all it ultimately did was leave a trail that lead English to suspect his plan. Sometimes this had me laughing out loud. Usually I was amused, but there are sequences that trade on Cringe Comedy, which I hate. It often managed to handle it in a way I wasn’t too horrified and sometimes even back to amused though. There’s little to the comedy in the overall movie that’s really clever like I hoped it would be, but if I really wanted witty one-liners, the real James Bond movies have them in spades. Maybe someone even deeper into British culture than I am would enjoy it more, but I had plenty of fun as it is.